A newly planted hedge. Credit: RHS/John Trenholm. Most trees and shrubs have potential to make hedges. More information on suitable species can be found on our selecting plants for hedging page. Hedging plants are often supplied as bare-root specimens, which are usually inexpensive. However, pot-grown plants are equally suitable but cost a little more. Evergreens, especially, are often sold as root-wrapped, where the roots are in a soil ball contained by a fabric casing. This wrapping must be removed, if it is of synthetic fibre, but natural fibre wrappings are sometimes left on. Removal of wrapping is still recommended, though. Small hedge plants are often called whips and are about 60cm (2ft) high. They are very cheap and are easy to establish. Larger plants need more care and are more expensive. It is best to plant whips closely as they not only form a thick hedge, but compete with each other and so reduce the amount of trimming required. In all cases, planting is best delayed until the soil can be worked easily, especially if the ground is frozen or waterlogged. 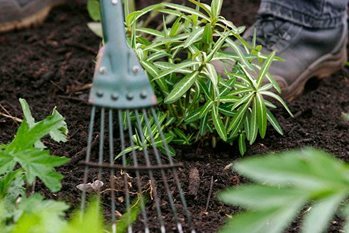 If there is a delay in planting, keep the plants in a frost-free shed and cover their roots with moist straw, paper or potting compost and plastic sheet. This will prevent them drying out. Alternatively, they can be temporarily planted very close together in a trench, with their roots covered in at least 20cm (8in) of soil (this is called heeling-in). Planting and caring for a new hedge is very similar to that for any new tree or shrub. Good soil preparation beforehand will give your hedge the best start in life. If a herbicide (weedkiller) has not been used beforehand, remove all weeds. Do not add organic matter to the bottom of the trench as it decomposes causing the shrub to sink. Hedges might take three to seven years to attain their desired size. You can buy semi-mature hedges which, although costly, will give an instant hedge. Semi-mature plants require extra care in planting and watering. Hedges might need shelter in their initial years on exposed sites. Hedges, like other trees and shrubs, are vulnerable to establishment problems.